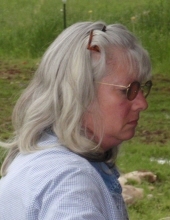 Deborah Mae Harmon, 60, died at her home in the Town of Hackett on Wednesday, April 10, 2019. She was born on May 4, 1958, in Tipton, Indiana, the daughter of Fredric and Marilyn (Boyles) Whisler. Following her schooling she was employed in the offices of Smeester Brothers Trucking in Iron Mountain, and it was there that she first met Ed, her future husband to be. Deborah and Edwin were married in Saint John the Baptist Catholic Church in Prentice on June 5, 1982. She enjoyed riding along with Ed on his over-the-road trips for Smeester. They made their home in the Prentice area in 1987, and she enjoyed the country life. In her free time she enjoyed fishing, gardening, baking, and in later years when declining health limited her, she enjoyed watching movies. She is survived by her husband, Edwin “Ed”, by one son, Grant, Phillips; by her mother, Marilyn Whisler, Phillips; and by three brothers, Kendric (Lyndia) Whisler, L’Anse, MI, Marcus (Loretta) Whisler, Green Bay, WI, and Douglas (Fay) Whisler, Iron Mountain, MI. She is preceded in death by one son, Lee; and by her father, Fredric Whisler. The family will receive friends at the Heindl Funeral Home in Phillips on Wednesday, April 17, from 9:00A.M. until 11:00 A.M.. Interment will be in the Prentice Cemetery in the Spring. To plant a tree in memory of Deborah Mae Harmon, please visit our Tribute Store. "Email Address" would like to share the life celebration of Deborah Mae Harmon. Click on the "link" to go to share a favorite memory or leave a condolence message for the family.